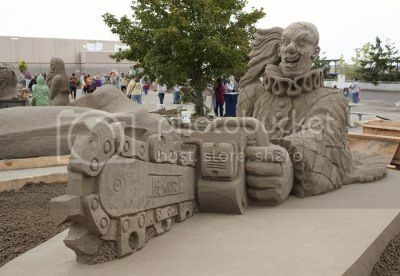 There’s nothing like a homicidal clown to bring mirth and joy to a sand-sculpting competition. Sweet dreams, kids! Quebec-based sculptor Marc Lepire works on his piece, “Krazy.” It was inspired by a character in a movie he watched with his son. Via The Wondrous, who doesn’t see what the problem is. Just tell the kids that Krazy is a very funny lumberjack or something.